All of the space and privacy of an estate home but the lock-and-go lifestyle of a city townhome. This cul-de-sac home offers a low maintenance yard but plenty of space to garden and grill. This specific enclave of homes is in the preferred part of Brookhaven Heights where there is less auto traffic and more pedestrians. (Not a cut-through section.) Rarely in Brookhaven for this price point do you find a home built in the recent years with this much space. There are 3 fireplaces, spacious rooms, and separate guest suite in the basement with interior/ext entrance. Driving Directions: From Peachtree turn at the traffic light at Colonial. Right at stop sign. Community at the end of the road on the right. First home on the right. 1229 Brookhaven Hideaway Court NE, Brookhaven, GA 30319 (MLS# 6511671) is a Single Family property with 4 bedrooms, 4 full bathrooms and 1 partial bathroom. 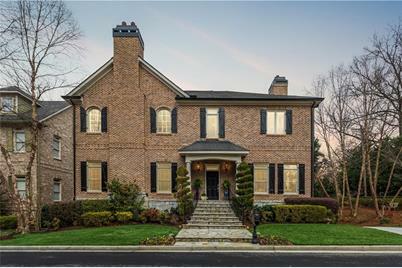 1229 Brookhaven Hideaway Court NE is currently listed for $788,000 and was received on February 28, 2019. Want to learn more about 1229 Brookhaven Hideaway Court NE? Do you have questions about finding other Single Family real estate for sale in Brookhaven? You can browse all Brookhaven real estate or contact a Coldwell Banker agent to request more information.